Find more inspiration for designing and planning a garden in our essential guide. For more ideas and advice for container gardening, don't miss our guide. Broken one of your favourite tea cups? Don't just put it in a box and pretend that one day you are going to transform it in to a mosaic mirror frame or something, put it to use in the garden by planting it up with some herbs. You will have to drill some drainage holes into the bottom of your beloved cup, then cover the bottom with some gravel or small stones, then pile up the compost to turn it into a mini alternative planter. If you are looking for more small garden ideas, head over to our dedicated feature. Honestly, they don't even have to be vintage – any pretty canisters or containers you have can be used as alternative planters. 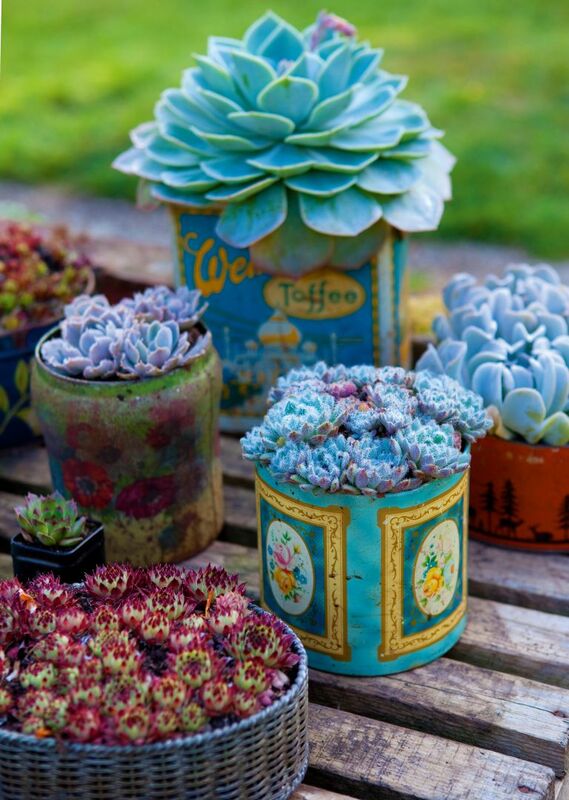 Keep an eye out in antique shops and charity shops for quirky finds; we love how these retro tins have been given a contemporary twist by being used to plant stylish succulents. Given we live in cooler climes, if you do choose to plant succulents, they may appreciate living inside for most of the year, so make sure you have a read through our guide to houseplants for advice. Teacups aren't the only kitchen item that can be reused as an alternative planter, check out how this old bread bin has been repurposed to hold a myriad of greenery. Recreate this eclectic, seemingly effortless look by grouping your alternative planters with pots of different textures – stone, terracotta, tin. Layering up different materials will add depth and interest to your arrangement. Top tip: Want new terracotta pots to quickly get that aged, mossy, I've been in this garden for centuries look? Lightly brush over your pots with some plain yoghurt and like nature do its thing. Sounds gross but works a treat. Who knew the kitchen could prove such a useful source for alternative planters? Even the most humble of leftover items can be used as an alternative planter. We love this idea of using reclaimed terracotta roof tiles as shallow planters. If you don't conveniently have some nice looking roof tiles hanging around your garden, you can actually buy reclaimed tiles from Ebay relatively cheaply. Fun fact, tiles also make for great border edges. The classic watering can as a planter trick. Upcycle your old watering can by drilling some holes in the base for draining and then filling it up will compost. You can plant a group of different flowering blooms in watering can, but we love how simple lavender gives this modern patio a traditional, rustic twist. Love the look of this patio? Head over to our perfect patio ideas for plenty more inspiration. Or old AGAs... We love this creative idea from @niki_fretwell, who has turned her AGA (which was condemned for cooking) into a herb garden. If you don't have a spare oven to upcycle, see if there are any pieces of furniture you could put to better use in the garden. You know that chest of drawer you keep meaning to take to the tip? Accept you will never do it, paint it with some exterior paint, and then simply fill the drawers with pots of herbs. We recommend either keeping your newly upcycled herb drawers in a greenhouse or somewhere that's undercover, like an outroom – find out how to create an outdoor room in our guide. Has your wheelbarrow seen better days? Don't get rid of it just yet, it might make for a lovely rustic alternative planter. As with most of these easy DIY planter alternatives, drill some holes in the base, cover it with small stones and then add compost. We really like the idea of using a wheelbarrow garden as a mini wildflower garden to attract insects. Find out how to create the perfect wildlife garden with our tips. What plants work best in alternative planters? Pansy – These dainty little perennials are usually grown as annuals and are handy for colour when other plants aren’t flowering. When buying them, select ones with buds rather than open flowers. Petunia – Prolific blooming makes these cheerful flowers ideal for summer pots and hanging baskets. Require full sun, regular feeding and deadheading. Fuchsia – Easy to grow and will provide flowers spring to autumn in a shady spot. Need frequent watering; keep moist but not soggy and deadhead. Hydrangea – The mophead and lacecap varieties are the easiest to grow in containers. Select a container just a little larger than the pot you bought the plant in as too large a pot can rot the roots. Salvia – Shrubby perennials with intensely coloured flowers. Some are hardier than others, but all need a sunny spot. Flowers from summer to autumn. Hosta – Arrange a collection in a shady corner and enjoy the foliage and spires of lavender flowers. Water carefully so they don’t dry out. Overwinter bring the containers inside. Heuchera – Shade perennials with interesting foliage in green, orange, silver, black or pink, with ruffled or smooth edges. Ensure good drainage and mix a slow-release fertiliser into the soil. Skimmia – Long-lasting evergreen shrubs that are ideal for containers. Grown for their glossy foliage, flowers and berries, they need semi-shade, slightly acidic soils, and prefer rainwater to tap water. Aster – Brighten up the patio as other flowers start to fade. They prefer soil a little on the dry side. Add some mulch and feed monthly through the growing season. Agapanthus – Particularly effective in a repeated line of containers in a sunny position. Reduce watering from September and protect in winter. Divide every three years once they’ve filled the pot, but they prefer not to have too much space.